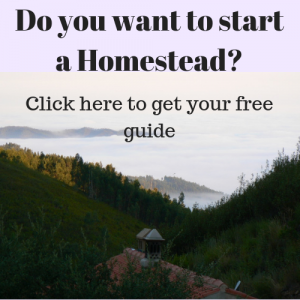 Home » Homesteading for beginners » Preparing for your homestead. Looking at all these beautiful blogs about homesteading you might think is the most beautiful way to spend your life. We do enjoy our live here on our homestead, but it is not what it seems to be. There is hardships and sad stories to tell as well. If you really want to start a homestead yourself, please check these other stories as well. It will give you a far better picture of what it is about. This way you will be much better prepared when you start. There are a view brave homesteaders that wrote confessions about their homesteading. I enjoyed reading them very much. It is all very recognisable. These stories give a glimpse of what homesteading and having a homestead truly means. So you really know what it is about and you can make the right choices for yourself. Grow your own food: Gardening skills and deceiving pictures. Using raw material is time consuming. Making money from the homestead. Here are some I really liked that you can look into later. In this blog Alyssa describes very well how they thought it was much different than they thought. Don’t worry they are still building up their homestead as you can see on their blog. There are many ways you can improve your lifestyle and live more sustainable. One is not necessarily better than the other. The shift to sustainable living does not need to be super radical. You can sometimes even do more than you think where you are. Or by just moving to another neighbourhood in the same area or town. Going out in the wild does not always mean that you can live more sustainable. It is not as black and white as it seems. Here on the homestead we use things that you would use in a town too. Like plastic bags(although I do not like them), a diesel car, electricity, T-shirts…We don’t have the money to always buy organic products or to buy solar panels. Being out here in nature does not mean you can do everything perfect. Yes, you can do what we did and move to another country, with another climate. Out into the ‘wild’. To start your own small or big farm. However It is far better to be prepared for the real thing than to follow a romantic idea. Mother Nature is often depicted as a Gaia that provides everything that you need. Living in a city like we were, not really confronted with her whims, you might be deceived by this picture of Gaia as we were. Turns out that Mother nature is not the big protecting mama that is going to feed you whenever you open your mouth to tell her that you are hungry. No, in real she is going to smack your bum really hard when you are lazy. She is going to teach you the hard way that you have to work hard to get your food. You have to follow her principles, she will make you miserable if you don’t. Mother nature will dictate your agenda. Yes, pretty much like a dictator. Here down south in Portugal the climate is very friendly to us humans. You can grow things the whole year around. When you work hard, the work will be rewarded. There will be plenty. But more up north it can be quite different. When you miss a crop, you have missed it and it can not be replaced with another. You will miss the food. Mother nature has more whims. There are storms that blow your greenhouse away that you had so carefully made out of plastic bottles. The wildfires that she brings (maybe supported by human action) destroy your food forest. It took you years to build up the small ecosystem or guilt. You feel you need to protect yourself against these energies, which puts even more pressure on your agenda and budget. There are a lot of romantic stories about Mother Nature. She is beautiful indeed, but not easy going. As most permaculture people will know, there is a lot to learn from her to our advantage. But cruelty and destruction are also part of the play. Be prepared. You can gain by making sure your garden skills are okay before you start your homestead. Get yourself an allotment and practice, or make a corner in your garden. Start easy by buying plants and some organic manure of some sort. Take it from there and slowly use more advanced methods. It is not as easy as it looks. Pretty much like learning how to swim. You see those people swimming in the pool and think: Wow, that looks easy. You jump in, like I did as a kid, and guess what, I sank…I am a good swimmer now though. Don’t forget that most of the pictures you see with the fancy ways and walls to grow plants in and on, are set up. For the picture big lettuces are put into the bottles to make it look nice. You can see this when you look carefully, they all have exactly the same size. Now, that is suspicious. Don’t be deceived. You can grow plants that way, but you do need to know what comes with it. Also we bloggers have the tendency to clear our garden before taking a picture. Or, like I do, we will take the picture so you do not see the messy parts. Using permaculture principles on the farm we produce for our own consumption first. This reduces our ecological footprint a lot, since the food does not need fuel to be transported to us. It is already there. We also know what we are eating. So to us that makes sense. After we have filled our stomages and our canning jars, we can sell our surplus. Can we? Since we are living in a rural area where everybody grows pretty much the same stuff it’s not so easy. So selling surplus at the local market sometimes does not work. When you have fava beans everybody has them. People will not buy our fava beans because the neighbours share them for free. That is a good principle too. But it does not bring in an income for us. We are happy that we can sell our organic fruit to a colleague who sells it in the nearest big town. When this town would not be there we would not be able to sell our fruit. So selling surplus sounds fair in theory but is not as easy as the principle suggests. What I want to say here is that some principles sound really easy when read from a piece of paper. Put into practice is quite a different story. The budget is another think to carefully think about. Building a new house costs money. You can use what you have on your land to a certain extent. But what about the tools you need? The nails, the screws, the light switches, the solar panels, the filling materials? In the end you will save some money on the wood you did not have to buy. But when the wood you can buy is cheap than you might not save at all. Because you will need extra material to turn your logs into proper planks. You will need material to make a space where your planks can dry etc. So building a house however way you do it, costs money. Unless you want to go very radical and live in a log hut. But that is rough. You need to be able to shoot your own rabbits…I mean there are a lot of skills needed for that lifestyle. I think It is good to think the costs through completely. We did not. 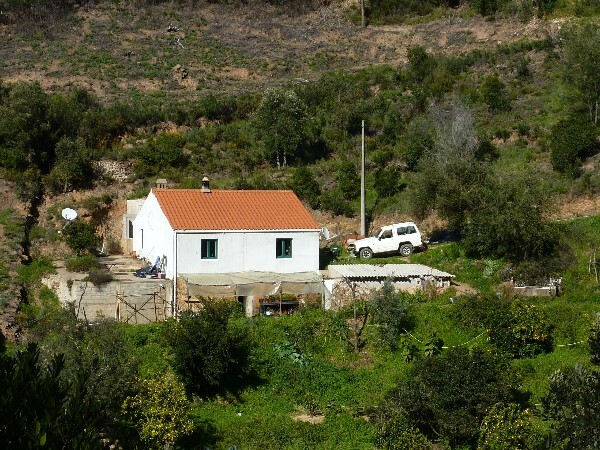 We had two good incomes before we went to Portugal and build the place up with the money we had spare. That worked fine until we went back to one income and Lehman brothers filed for bankruptcy, which led to a world wide crisis 2 years later. This was the moment that we started. Coming from a comfortable situation we just didn’t imagine things were going to be so tough. Our budget shrank to one fifth of what we used to have and we had a massive project ahead. We survived, managed to build up our homestead, still not having a bathroom in our house, but who cares. There are two bathrooms in the tourist accommodations that we use in winter. In the summer we use the garden hose behind the house. We have a compost toilet in the house so we do not need to sit in the rain. Many tears and a lot of sweat later we made it to the other side. I could think of wiser ways to get there. Also using material that you have on the land is mostly very time consuming. It can be very hard work too. Sometimes much more work than earning money and buying material. When you buy prepared material a lot of effort is already put into the material to make it ready for use. Because this is done in large numbers it can be done cheaper than you can do it yourself. It is all a matter of calculation. Our site is very steep. Some hardliners who have joined our building projects had critics on the fact that we use cement. Building projects need a lot of preparation. The preparations are time consuming, boring and sometimes costly. So preparations are very often not presented in courses where you can learn about using cob, straw bales or logs. Dragging stuff down on our land without a donkey is hard work. And with a donkey it would take ages. So you go for the lighter materials, in this case part of it being cement. Again don’t be deceived by the romantic picture. Making money with a homestead and building it up in one go is also not so easy. There are many ways to make money with a homestead but there are only 24 hours in a day. From those 24 hours you need to sleep and eat. If you do not want to burn out you will need to rest as well. And remember you were still building a house. This needs to be thought through very carefully. For example: Here in Portugal a good tasty egg brings in 20 cents. A good chicken lays one egg a day. To have an income from eggs, say 800€ a month, how many chickens do you need? One chicken lay 30 eggs a month worth 6€ a month. Calculating losses, non laying chicken (because they are not laying yet) etc. in you will need 200 chickens. That is a lot for a small income. In Europe with 200 chickens you already need to meet a lot of regulations, which means you will have to invest. Will selling some eggs help? Yes, it does, if only to get your eggs for free. But it will not help you get all the investments you need for building up your place together. The other strategy is to do more than one thing. You do need to pick these things carefully though, because they will consume time. It is not possible to handle too many things. So what you pick needs to bring in a substantial amount, without having to do to big an investment. After all you will need the investment for your home. And just remember whatever you pick everything takes effort and time to get it started. In the coming blogs I will pay more detailed attention to the different topics described here. Connect with us or follow our Facebook and you will get notified by email or Facebook. When I saw your homes it instantly took me back to the azores. I would love to do homesteading but I think it is much harder than it looks especially if you don’t have extra hands for support. I think that is very true. It is not so easy at all. But still we enjoy it. I have volunteers helping us every now and then. Also friends and family are helping us out when we have a lot or get stuck.